Adrianne Kalfopoulou, poet, professor, and Plathian scholar, currently lives and teaches in Athens, Greece, where she teaches at Hellenic American University/HAEC; she has also taught in the Creative Writing Program at New York University and at the University of Freiburg. 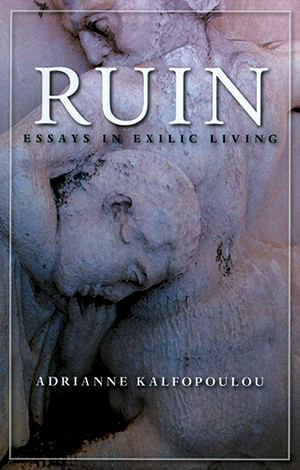 Kalfopoulou’s latest work, Ruin: Essays in Exilic Living, documents her life as she travels from Edinburgh to New York, Freiburg, then back home to Athens. In Ruin, readers become part of the “camaraderie of travelers”—enthusiastically sightseeing or nervously broaching global politics with strangers. The collection uses sharp, lyrical prose to ruminate on issues of motherhood and language, power and protests. Kalfopoulou’s application of Greek myth to the personal mirrors her ability throughout the collection to juxtapose heady theorists with coffee-shop chatter. 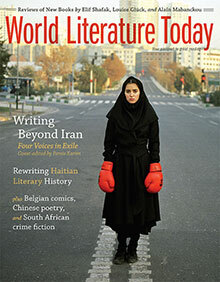 Within the same April chapter, Kalfopoulou meshes the academic with the banal, referencing a New York Times article, poetry from Mahmoud Darwish, the early-twentieth-century history of Greece, and conversations overheard on NJ Transit. The last chapter of the book even includes the author’s own poems. The collection offers intimate knowledge of modern Greece, painting a picture of its streets, sound, and smells (even if not pleasant, especially when illustrating the garbage strike). Kalfopoulou analyzes Greece’s former prime minister, George Papandreou, and his words as insightfully as she does graffiti on the walls or the homeless in the streets. The experience of Ruin is encapsulated in one line: “I am strangely freed in this city, perhaps because my eventual leaving allows for more acute desire.” One can easily replace “city” with “book” here—this hybrid work, combining poetry, journalism, and memoir, leaves us all wanting more. Najwan Darwish. Kareem James Abu-Zeid, tr.